Production line in full flow as V4 SS models get finishing touches. The very first Norton V4 SS superbikes have rolled off the new production line at the Donington Hall factory, and were united with their owners on Monday afternoon as Norton simultaneously unveiled the next chapter for their sportsbike family, the Norton 650cc Superlight, at Motorcycle Live. 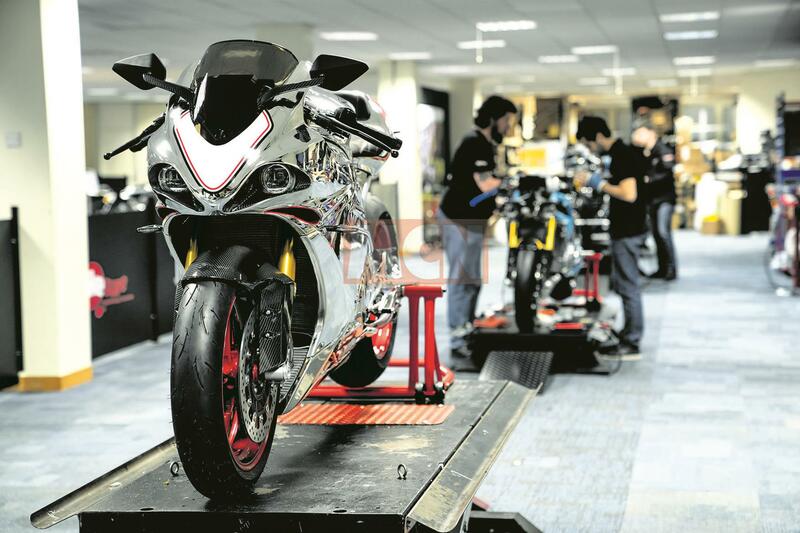 The complexity of building a completely new superbike with their own design of chassis, V4 engine, bespoke electronics package, and a new supply chain for everything from the engine parts and wheels to the unique carbon fibre fuel tank, have made getting to the start of production a herculean task. With final electronics calibration concluding just weeks ago, all the pieces of the jigsaw are now able to come together and the factory is buzzing with activity as frames emerge from the fabrication and welding area and engines come off the assembly line to meet the rest of the high-end package at the start of the production line. At this point each individual bike is then built to the customer order spec in accordance with its chassis number and individual edition number. The SS models are all numbered limited editions, while the RR models that will follow are simply built to order. All of the £44,000 V4 SS models sold out within weeks of the bike being announced almost exactly two years ago, while the V4 RR can be ordered at £28,000 with numerous spec options available, including a full titanium race exhaust that sheds 8kg and adds around 10bhp more to the 200bhp output of this Isle of Man bred superbike. With Norton announcing the new Norton Atlas motorcycle range just two weeks ago, and unveiling the new 650-engined Superlight at this week’s Motorcycle live, the firm now has three distinct families of bikes, catering for everything from the retro purist to the trackday addict.